We just feel the actual worth of a coffee when it is a coffee time, a snack time or you have to put some decors inside of your cozy living room! 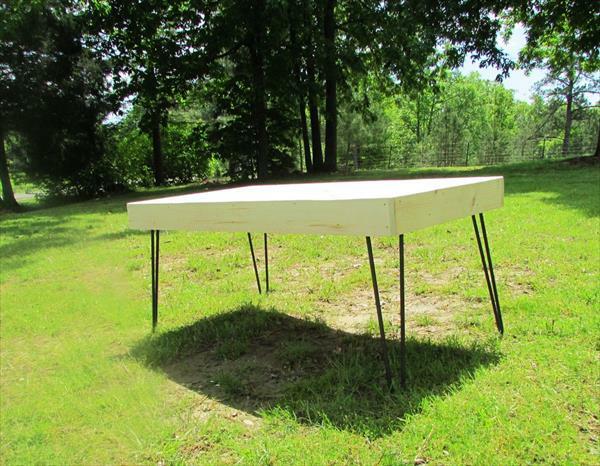 If the busy routines of life are not leaving you alone at all and you really have no time to shop some furniture or a coffee table for home then build your own table at home at this weekend! Take a look at this DIY industrial style pallet coffee table which is purely handmade and is creative amalgamation of salvaged wood and metal! This table comes with an artistic look due to amazingly patterned top that is whole responsible for its unique appearance! Using pallets of different wood species and also some other reclaimed wood, the multi-toned wooden appeal has been achieved that gives an enriched wooden character to his sublime handcrafted table design! Table has finished with metal 2 post hairpin legs that bring an industrial style to table and dignify the whole wood medium with their accent metal touch!